When working with a client on a custom piece of furniture, there are several decisions that need to be made: paint type? color? technique? distressing? style? More often than not, I get to use my creative judgement and make most of these choices myself, but if a client has a clear direction in mind, making sure they're happy with the outcome and that it aligns with their vision. 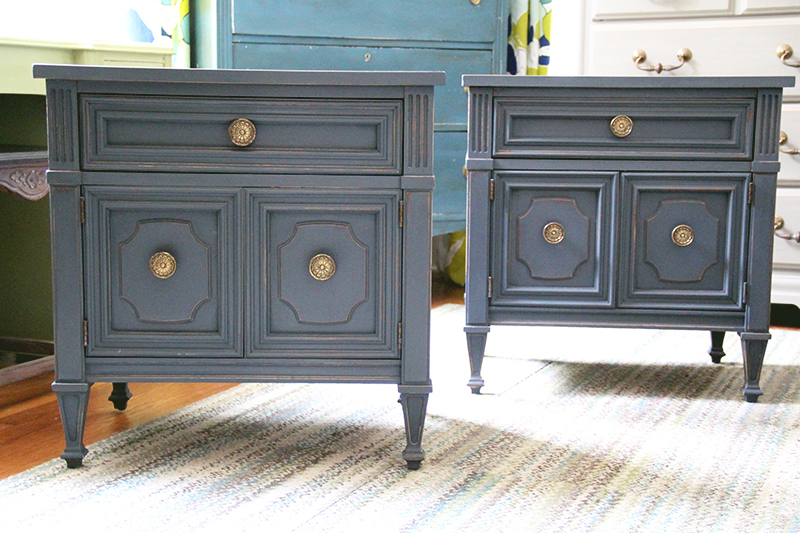 For this pair of nightstands, it took several meetings to hone in on what paint color would be best. The client wanted to use these as a jumping off point for the rest of her master bedroom, so the color chosen here would dictate how she designed the rest of the space. We went back and forth between several blues and grays and different levels of distressing and waxing. I showed her multiple samples and finished furniture pieces, but still she couldn't decide what color was best. Furniture can be a big investment, so it's important to love what you go with. What I ultimately recommended was a combination of two colors: Annie Sloan's Graphite and Napoleonic Blue. It allows the blue tones to stay subtle and neutral, while also bringing in just enough color. This hybrid blue-gray combination also allows the brass hardware to really pop. They have a beautiful floral detail that I love. This color also works seamlessly with the original wood tone of the nightstands, and the subtle distressing brings in warm highlights throughout the piece and accentuates the details perfectly. I had to include this photo of my adorable kitten, Maggie, since she loves to model all my furniture [and makes everything look so good!]. If you're interested in getting a quote for a custom piece, head to my Services page and send me a message!